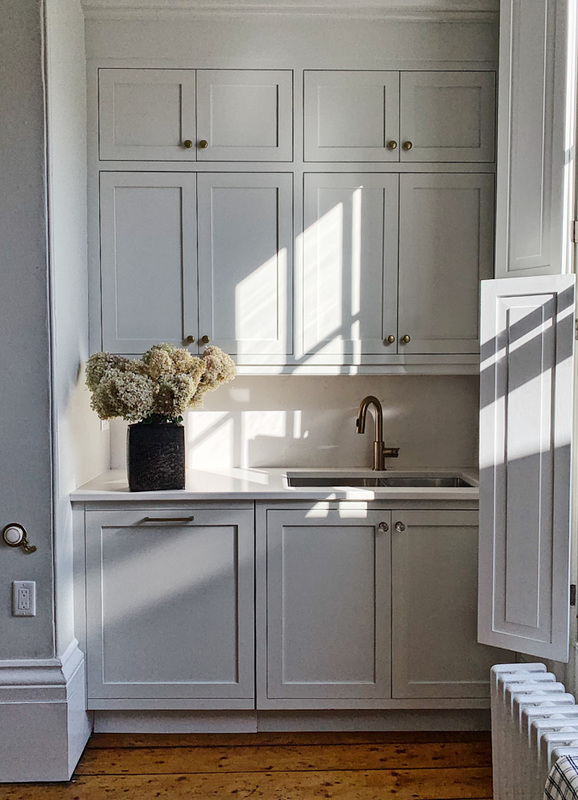 The south sun streams through our kitchen windows mid-morning and casts long strips of sharp light across the counter, the cupboards and the floorboards. Yesterday it shone through the tulips, turning the dark purple leaves an iridescent mauve. The beams of light are architectural, with long shadows of window framed by sunshine. If feels like mid-summer, for a moment at least, until the light shifts upward and away and all that’s left is the ice on the window. I sound depressed. I’m not, I’m just sick. Achy, coughing, sore throat sick. It’s day four. But being sick means time for podcasts. Time to read. To watch shows. To scroll through my 5,000 photos on my phone, remembering my youngest’s blond curls when he was small and had a soother permanently lodged in his mouth. It also means time to surrender. That word, surrender, reminds me of that time I tried to drape my stiff, postnatal body over an exercise ball as the instructor said, ‘You know it’s easier if you just surrender.” She was right. When I let go of everything, I melted over that thing. It’s hard to surrender, to melt, as the world spins around us. I want to climb every mountain and ford every stream, just like Maria. I want to push my work out into the world while simultaneously trying to be a mother. It’s a fine balance, until the scales tip and things fall apart. “Your generation tries to do WAY more than we did,” my mom said as we sipped coffee a few weeks ago. “Won’t it feel good to let some things go?” She said this as I told her about two of my boys in particular, and how they needed me now more than ever. Life is easier, I’ve learned, when you surrender to this stuff. Melt into that thing. While lying around this week, melting into the sickness, I listened to a Freakonomics episode featuring New York Times Illustrator Christoph Niemann on where good ideas come from. Niemann explained that he primarily works with editors, creating an illustration to accompany an already established magazine piece. The story isn’t his, it might be boring, but it’s his job, he says, to make it interesting. Quickly. Working at home, being a mother, being sick, these are my restrictions. But they’re holding me up. I lean on them. Sometimes it’s boring, but it’s my job to make it interesting. And within these boundaries, I can celebrate the little things. I can find meaning in the everyday. I can move into that beam of light, make a colourful salad, and enjoy it quickly, before the sun shifts upward and away. In the winter I love the warmth and tenderness of roasted vegetables juxtaposed against raw. It’s the perfect bridge this time of year, when snow is on the ground but the sun shines bright. And speaking of sun, a little preserved lemon on any salad will add sunshine to anything, any time of the year. The ingredients below are what I had on hand. Use what you have! On a baking tray, toss sweet potato and red onion with olive oil. Sprinkle with sea salt. Roast vegetables for 20 minutes, stirring occasionally, until sweet potatoes are tender and onions are soft and tips are browning. Set aside to cool a little. Toss radicchio, beetroot slices and roasted vegetables in a salad bowl. Drizzle with salad dressing, then top with micro greens and thinly sliced preserved lemon (or zest). Finish with a few grinds of pepper. 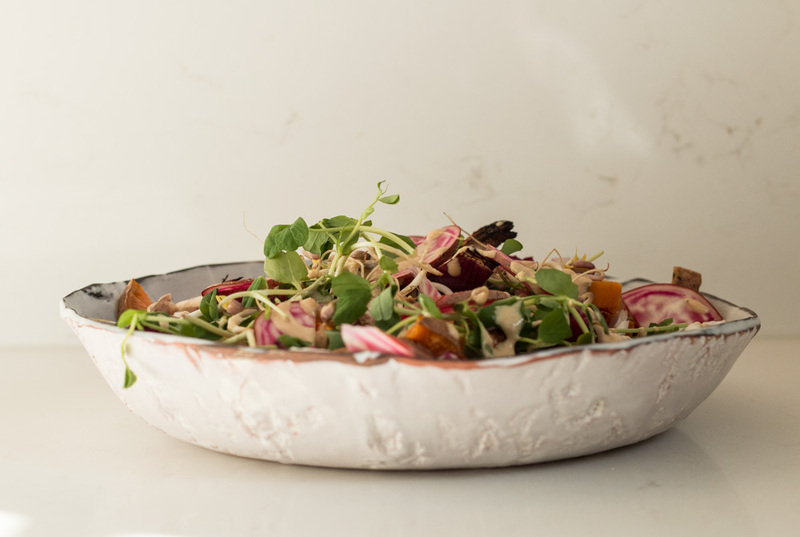 This dressing will add instant personality to salads, sliced raw or roasted vegetables. It’ll keep in a jar in the refrigerator for up to a week, just whisk in a little water before serving to loosen it up. In a small bowl, whisk miso, tahini, lemon juice and black pepper together until smooth. Whisk in water, slowly, until ‘dripping’ consistency. That is, I like to drip the dressing off the end of the whisk over the salad. Look for preserved lemons in Middle Eastern food shops, or you can make them at home. This jar was a gift from Michelle of chocolate frosting fame. Her recipe comes from our friend and cookbook author Aimée Wimbush-Bourque. 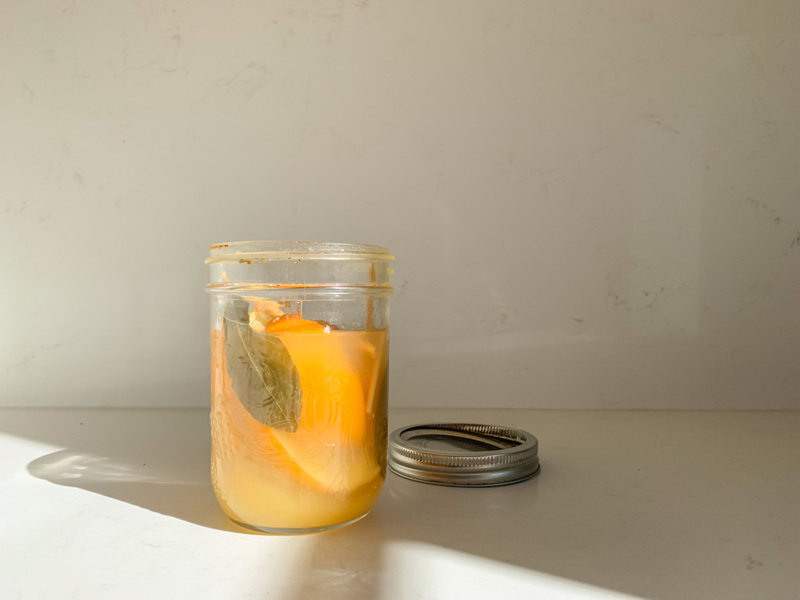 You can find the recipe on her blog Simple Bites, along with tips on how to use preserved lemons in myriad ways.